Here at Schill, our crews mow over 11,000 times per year on the retail, HOA, apartment, and commercial properties we manage. Needless to say, we know a lot about proper mowing techniques, including the best type of mower for every property and how to identify and treat common tuft diseases. But sometimes there are days when we choose not to service our scheduled properties. If you’re a customer of ours, you know we like to send out emails when the weather is particularly nasty (leave us some feedback here if you’d like to be added to that mailing list). This isn’t because our crews are afraid of getting wet (though slipping on wet turf is a possibility), but because mowing in conditions like heavy rain can actually cause serious harm to your turf. Northeast Ohio has summers that can be almost as unpredictable as its winters. Some years there are droughts, and in others (like this one) it seems to rain heavily every week. Each change in the weather should lead to a reconsideration of your landscape maintenance regimen, and we know all of these variables can be overwhelming to property owners and managers. So, we wrote this article to help people gain a better understanding of their turf’s needs across changes in weather conditions and equipment quality. 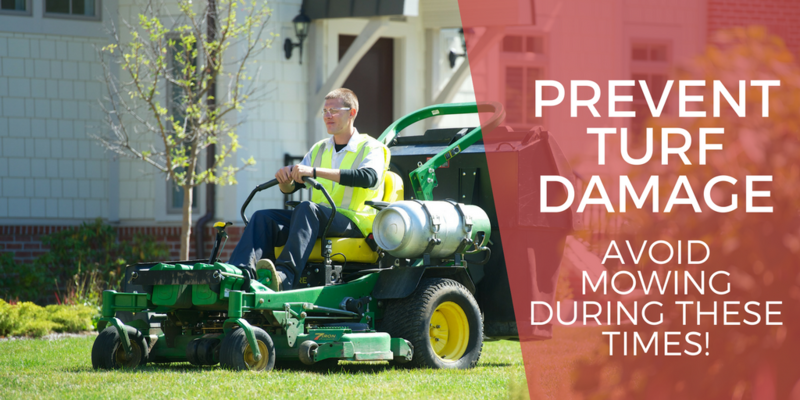 Riding mowers can handle damp turf with ease, but even property owners who have access to these heavy-duty machines should hold off on mowing turf that’s completely saturated. Wet grass clumps together, which not only causes stress for mower blades and engines, but can also prevent sunlight from reaching the turf. This often leads to mold, diseases, and chronically moist turf that’s an optimal breeding ground for pests. Clean up can also be a real pain after wet grass is mowed: clippings that cling to cut grass and nearby fixtures like parked cars or flower beds often need to be removed afterward. To avoid this, we suggest bagging or mulching these clippings, which are great for adding nutrients back into your turf. This can lower your dependency on both organic and chemical fertilizer. There’s nothing wrong with mowing your turf in a drought, but there are some changes that need to be made to minimize the chance of damage. Raise your mower’s deck height by a half of an inch when grass is drought stressed, as thirsty grass will grow at a slower rate. During dry seasons, the Schill team works hard to make sure turf is drought resistant by making sure turf gets plenty of moisture when water is plentiful. For properties that have irrigation systems in place, this is easy, but landscapes without them require much more attention. Shallow watering, whatever the weather conditions, will produce grass that’s not nearly as hearty as turf that’s been watered deeply. Don’t wait too long to get this right! It’s too late to start a proper watering regimen once a drought is officially in place and water restrictions are enforced. Shaving your face with a razor that’s dull is more likely to cause infection, injury, and irritation, and the blades on your mower are no different. Dull mower blades can cause a host of problems for your turf, leading to uneven cuts that can leave each blade of grass looking dry and shredded like the picture on the right. While the average homeowner can get away with sharpening their blades twice per season, it’s important to make sure that your landscaping contractor is sharpening their blades much more frequently when working on your commercial property. 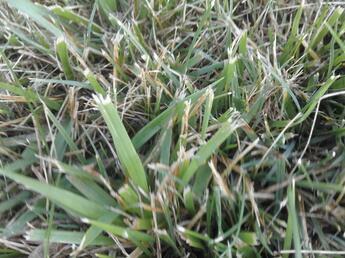 Still not convinced that mowing with sharp blades is worth the time it takes to sharpen them? 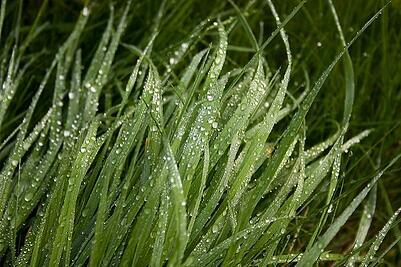 Mowing with dull blades will actually cost you more time mowing, as they have a harder time cutting through grass. This means that if your landscape maintenance provider is spending more time on your property because they’re working with a host of mowers with dull blades on your property, you could end up ultimately paying more in labor costs as well. It’s best to wait a few weeks for germination of grass seedlings to kick in, and the same amount of time is recommended before mowing new sod. Furthermore, healthy grass requires healthy soil, and mowing grass too soon could compromise that as well: If your new grass was installed correctly (whether you used seed or sod), then your soil is at the optimal aeration during these first few crucial weeks.The weight of a lawn mower could cause soil compaction, which will make it more difficult for your tuft to remain healthy in the future. Studies show that compacted soil can result in plants (and, by extension, turf) that grow at a 50% slower rate than soil that gets the proper amount of air. But not only is there a time limit on mowing new grass, there’s also a height limit to be mindful of as well. In general, grass shouldn’t be mowed lower than three inches, so it’s best to wait until your new turf reaches at least 3.5 inches. 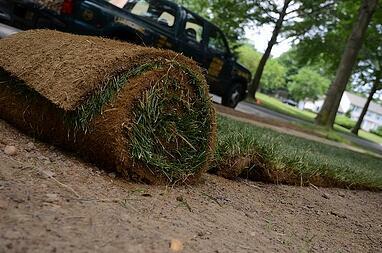 Cutting too low can cause stress to the new roots of your turf, which will remain delicate for several weeks. The Schill team always gets it right. You don’t have to spend time wondering if the time is right to mow. 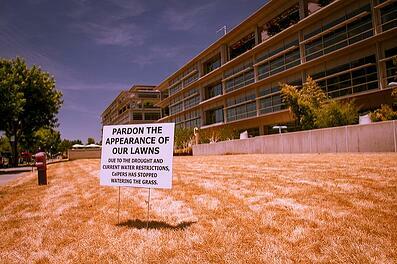 Instead, consider hiring a certified commercial landscaping contractor that knows what to do. We’ve spent hundreds of hours making sure our crews are properly educated on how to make Northeast Ohio’s commercial properties look their best, and our experience doesn’t stop at mowing. Our guys and girls know how to spot and treat common diseases, pests, and how to feed your turf the nutrients it needs to remain healthy year after year. Contact us today for a no-stress consultation, or check out our free guide to hiring a landscape maintenance provider for your commercial property. It has everything you need to know to make sure you’re comparing bids and contracts correctly.